Welcome to Travel Advisor Insider for news and information that will help you expand your business and your bottom line. This quarterly newsletter you’ll find information about upcoming webinars and other useful topics to assist you in building your business. At Big Five, we focus on the space between – between what is expected and what is unknown; between where tourism is and where we want to travel. Each of us needs to explore what is most important to us while we also strive to meet the challenge to use travel to better the world, to change others’ lives and redefine preservation and conservation in ways philanthropy alone simply cannot. To begin your personal exploration of the space between, reserve your copy of Navigator Series® Edition III, arriving this month. 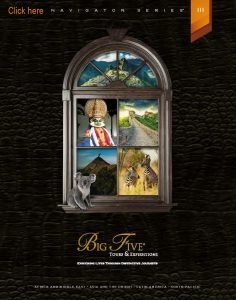 To order, email reception@bigfive.com, or call 800 244 3483 or use the Brochure Order Form. It works best as a lead generator when hand delivered with a note and followed up with a call to see how the clients responded. To request your own copy of this brief letter that you can personalize with your contact information and logo, please contact info@bigfive.com and write Request Sample Letter in the subject line. To request a proposal/quote, you can contact us at that same email address, or call 800 244 3483, or contact your Big Five Destination Specialist. Robert began his journey in the travel industry in the mid 1960’s as a flight attendant for SFO Helicopter Airlines, and continued in the industry, including working with TWA, where, in 1985, he was one of only six employees to work the special phone line during TW847 Beirut hijacking, talking to family members of those on the aircraft during the crisis. 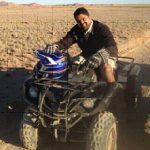 After time at a large agency in New York, he moved back to his hometown, Lodi, California, to become a travel agent and to be close to his family. In 1997, he purchased L & L Travel. Next year, Robert will celebrate 20 years as the owner of L & L Travel. He discovered Big Five through his membership in WESTA. Register here & mark your calendar! Join Ashish Sanghrajka, Big Five president, as he talks about Botswana, one of the last frontiers representing the essence of what Africa needs to become to confront the many challenges it faces from poaching to sustainability. Learn about how this destination is getting it right! Discover how, by simply choosing to explore places others have long overlooked, you become part of the solution – without donations, without volunteering. Your choices truly matter, and your tourism dollars can make the difference between these incredibly special places surviving or not. This is information you need to know. Don’t miss this informative webinar. We have expanded our Precious Journeys™ collection to include Precious Journeys™ College Edition. An innovative approach to family travel that allows young adults to continue to explore while still with their families, and, before they head off to college, careers and their future lives. At the same time, begin to use the knowledge and skills they have gained up to this point with opportunities to investigate interests from graffiti as found in Buenos Aires, Colombia and elsewhere; to a multi-day trek walk in Australia’s amazing wilderness; to an amazing cultural experience climbing up 750 steps of Sri Lanka’s 12th-century Sigiriya Rock Fortress. Also don’t forget to visit New Adventures as well as our President’s Picks collection to see new adventures such as the Incredible Indochina and Botswana & South Africa.